My research interests centre on the fundamental fluid dynamics of the ocean and climate such as frontal processes, eddies, internal waves, and water mass transformations. I construct mathematical models and run idealised numerical simulations to examine these processes. Some current and previous projects are described under the "Research" tab above. See Google Scholar for publications. My current CV is available here. The ocean is a sea of internal gravity waves. Similar to the gravity waves that propagate over the ocean surface and break along our coastlines, internal waves propagate great distances through the ocean interior. These waves are generated at the ocean surface and the seafloor by a variety of mechanisms. As the waves propagate, they interact with the ocean currents, jets and eddies. These interactions often involve an exchange of energy either to the internal waves (amplifying them) or away from the waves (weakening them). The location and direction of these energy exchanges tell us about the pathways by which energy moves through the ocean system from the very largest scales where it is injected by tides and winds, to the very smallest scales where it is dissipated as heat. The image below shows internal waves being amplified in the upper ocean by the shear associated with large-scale currents and eddies. Student projects are available on this topic. Internal waves can be generated spontaneously from unbalaced flow near the ocean surface. Recently we can been examining the energy budget and life cycle of such waves in the ocean, and how they interact with the other (non-wave) flow. As the waves are generated they draw energy from the jets and eddies near the surface. The waves propagate downwards as a concentrated band of energy flux (shown in blue). Some of this energy is lost to dissipation and mixing. However, much of the energy is reflected back off the bottom into an upgoing wave flux (shown in red), Again, some energy is dissipated, but the majority is re-absorbed the near-surface jets and eddies (in a different location to where it was emitted). This "wave life cycle" conflicts the classical picture where energy fluxes are always from jets, eddies and other large-scale flow TO waves, with minimal feedback. What does this new paradigm mean for the ocean energy budget and mixing? Curved density fronts and eddies: "Cyclogeostrophic frontogenesis"
This project seeks to address the role of curvature in modifying the dynamics of frontal systems. I have developed a simplified axi-symmetric mathematical description of a 'front' --- or equivalently a perfectly circular eddy (Shakespeare 2016). An example of how such a system adjusts from some initial motionless state to a final, balanced state is shown in the image below. The eddy slumps outwards and accelerates until a balance is achieved between the Coriolis, pressure and centripetal forces (known as 'cyclogeostrophic balance'). Curvature has the effect of introducing an asymmetry between eddies (fronts) that have a core warmer than the surrounding fluid and those that have a core colder than the surrounding fluid. Warm-cores have large horizontal flow speeds and are more likely to break down (and do so more rapidly) than cold-cores. However, vertical flow speeds associated with frontal sharpening at of a cold-core is stronger than for a warm-core. Frontogenesis is just fancy way of saying "front formation". Fronts, in this context, are regions of sharp density contrast that occur in the ocean and atmosphere boundary layers. They are typically associated with large vertical velocities. In the atmosphere this implies rapidly rising air, and therefore the potential for heavy rain or snow. In the ocean, the large vertical velocities are important for the vertical transport of nutrients, heat and carbon dioxide between the ocean surface and interior. Spontaneous: Waves can also be generated spontaneously from a front as strain forces a collapse to small scales. The magnitude of this generation is strongly controlled by the value of the Rossby number, Ro, mentioned above. Spontaneous wave generation associated with frontogenesis may be responsible for the formation of squall lines, which are lines of intense upwelling (and often heavy rainfall) located ahead of atmospheric cold fronts (see Shakespeare and Taylor, 2014). The mechanism of generation is very similar to that of lee wave generation at a rigid obstacle. Waves are generated at the front and trapped in a distinctive "palm-frond" pattern as seen in the simulation shown above (Shakespeare and Taylor 2015 has the details). The ocean transports and stores huge quantities of heat, salt, carbon dioxide and many other tracers. This transport is achieved via the Meridional Overturning Circulation. The ocean's role in future climatic changes is closely tied to how this circulation responds to changing surface forcing from the atmosphere. In this project we develop a very simple analytic model of the MOC in the Atlantic basin by parametrising the key processes driving the system and applying simple conservation laws. A schematic of the model is shown in the adjoining figure. Using this model we can test how the the ocean circulation will respond to changes in Southern Ocean winds, as well as the pattern and strength of surface buoyancy fluxes. See Shakespeare and Hogg 2012. Cabbeling is the process where two water masses of equal density mix to create a denser water mass owing to non-linearities in the seawater equations of state. 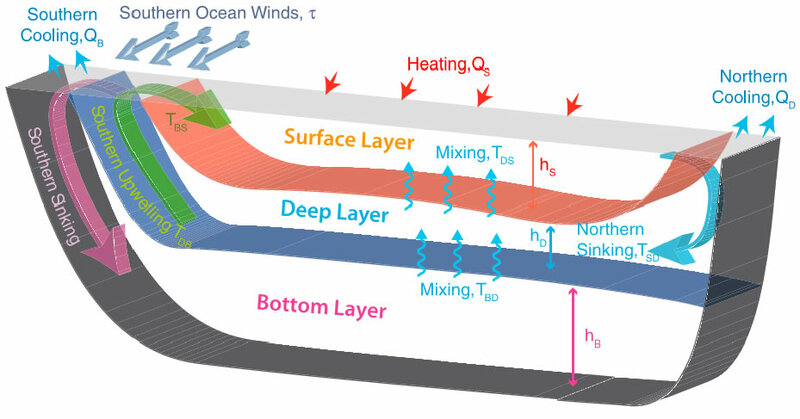 Cabbeling is likely to be signficant at Temperature-Salinity (TS) fronts with large temperature contrasts such as the Gulf Stream, Kuroshio, and Subantarctic fronts. Previous work has suggested that cabbeling by itself (i.e. unforced small-scale mixing along density surfaces) will not drive significant water mass transformation. However, this work did not consider the presence of background confluent flows at many of these fronts due to the action of ocean gyres and mesoscale eddies. The confluent flow is able to balance small-scale mixing and give rise to a steady state water mass transformation. We develop a simple idealised model to demonstrate these dynamics (see Thomas and Shakespeare 2015). More recently we have run idealised numerical simulations in MITgcm (http://mitgcm.org) to illustrate the process (Shakespeare and Thomas 2017) . 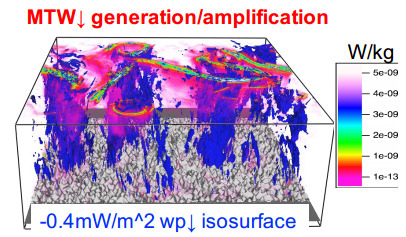 These simulations resolve the submesoscale eddies that drive mixing and confirm that cabbeling can account for a large fraction of observed mode water formation. A set of 25,000 flow-following parcels from one of these simulations is shown in the image above. The colours indicate the density of the water parcels (red = light, blue = heavy). The large-scale eddy field pushes the parcels in towards the front, which becomes unstable around 50 days, leading to rapid mixing and densification via cabbeling (note the rapid change in the parcel density: colour changes from red to blue). Cabbeling at a strained fronts such as the Subantarctic Front or Gulf Stream north wall can drive significant mode water formation. 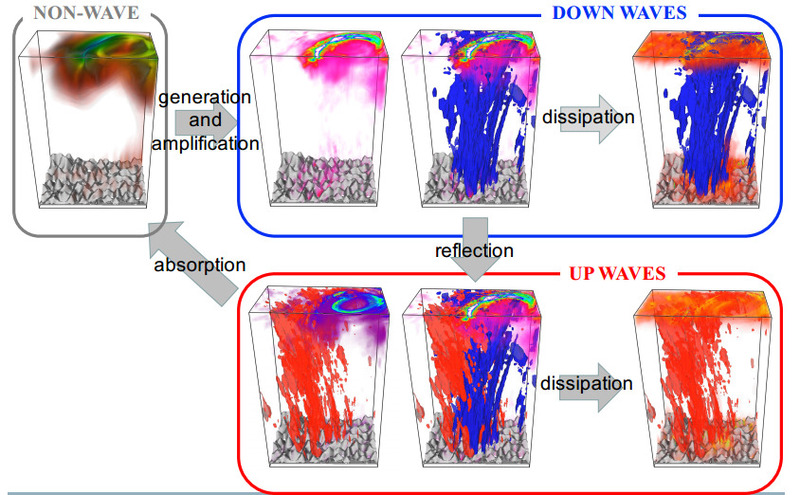 We develop a simple first-order scaling for the water mass transformation. Numerical simulations confirm that cabbeling can drive large water mass transformations. The cabbeling mechanism is likely play a first-order role in setting the properties of mode waters in the oceans.